Members of a Missouri-based KKK chapter have been distributing fliers in the St. Louis metro area and on social media promising to use "lethal force" against Ferguson protesters they say have threatened police officers and their families. 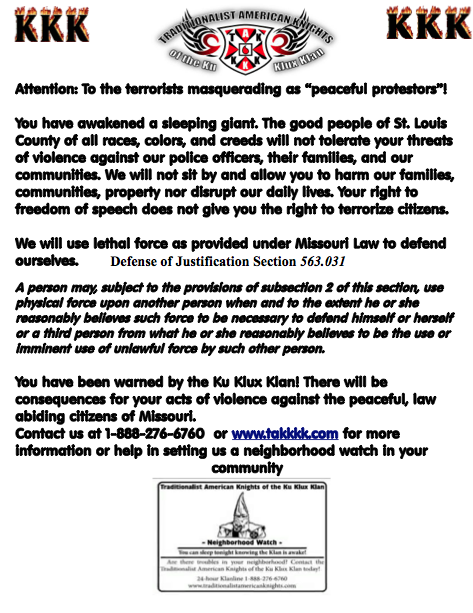 In the flier, the Traditionalist American Knights of the Ku Klux Klan refer to the protesters as "terrorists" masquerading as peaceful, and says that they have "awakened a sleeping giant." "You have been warned by the Ku Klux Klan!" the flier exclaims. "There will be consequences for your acts of violence against the peaceful, law-abiding citizens of Missouri." It's not the first time the Klan — which is widely regarded as a hate group for its history of persecuting and abusing minorities — has taken a stand on the Ferguson protests, which have exposed deep racial tensions in the St. Louis area and inspired waves of racist and hateful speech on social media. In August, a different KKK chapter declared that it was fundraising for Darren Wilson, the police officer whose fatal shooting of unarmed teenager Michael Brown prompted public outcry. Wilson remains free and unindicted pending a grand jury decision on whether to charge him with a crime. A Ku Klux Klan group claims it is around Ferguson and fundraising for Darren Wilson. Read more here. At the time, the Traditionalist American Knights expressed skepticism of the fundraiser and noted that an avowed KKK presence in the area would obviously be problematic. "There hasn't been some kind of mandate coming down from the top saying we need to get people out to Ferguson," Frank Ancona, the group's Imperial Wizard, told VICE News in August. "I see no purpose to interject the Klan into this whatsoever. We'd create more discord and more animosity against whites and law enforcement up there if we were present." Now Ancona's group is claiming that weeks of demonstrations have boosted its recruitment of new members. "These Ferguson protesters are the best recruiters since Obama," Ancona remarked to the Riverfront Times this week, adding that he has inducted 50 new Klansmen this month alone. "Normally we might hear from 10 people a week in Missouri, and now we're hearing from more like 50 people a week. Sometimes, depending on these news stories, we get 100, 200 calls in a day." But others question the Klan's assertion that the protests had resulted in hundreds of calls from potential recruits, suggesting instead that the group is boasting in order to hide its declining influence. The Traditionalist American Knights had recently blamed the media and the government on their website for trying to convince people that it is "no longer relevant." "We've heard these types of claims often, particularly after the election of Barack Obama," Lecia Brooks, the Southern Poverty Law Center's outreach director, told VICE News. "There is simply no way to verify whether it is true or simply a publicity stunt." The Traditionalist American Knights did not immediately respond to a VICE News request for comment. 'Want some Klandy?' The Ku Klux Klan launches a nationwide propaganda push. Read more here. Brooks called the Klan's efforts to capitalize on the tensions surrounding Ferguson "sickening but not surprising." "After all, the Klan is America's oldest racist hate group and has been responsible for some of the most heinous acts of domestic terrorism this country has seen, all in the name of white supremacy," she said. "This group's threat of using 'lethal force' is nothing but vigilantism, and has no place in America. Local law enforcement should take note." The Traditionalist American Knights, who claimed that they were getting involved in the Ferguson protests in response to aggression on the part of protesters, specifically singled out Bassem Masri, a local activist and live streamer. Masri told VICE News that statements he made in October after the killing of Vonderrit Myers by an off-duty cop were misunderstood. As Masri was live-streaming a protest, he was heard saying to a police officer, "Your life is in danger, homie," asking him, "What happens when we take your gun?" He attributed the comments to the emotion of the moment, and said that more attention had been paid to them than to the actual violence carried out by police. "The threats they say I made were taken out of context. Some were not even my voice, but they blame it on me anyway," he said. "These 'threats' are irrelevant. Cops threaten and act on them, they are the ones perpetrating violence not us. To this day not one has been hurt." A KKK member is starting a racially inclusive Klan chapter in Montana. Read more here. Masri called the KKK's own threat of force "cowardly." "If they want to perpetuate hate, we can't stop them, but we can surely let them know we ain't going for it," he said. "They are using the KKK to change the narrative to something they want, which is a race war which we are not advocating for, taking the story off [Missouri Governor Jay] Nixon, [St. Louis Country prosecutor Bob] McCulluch, and Darren Wilson." "It's ok for the KKK to hate folks but God forbid a minority speaks up," he added. Ancona defended his group's flier in an interview with MSNBC, claiming that its language is "not inciting violence." "Actually, it's addressing the people who are making these terroristic threats," he insisted. "The flier, if you read it, says 'defend.' "
The flier cites Missouri law, which allows individuals to use physical force "when and to the extent he or she reasonably believes such force to be necessary to defend himself or herself or a third person from what he or she reasonably believes to be the use or imminent use of unlawful force by such other person." From Guantanamo to Ferguson: America's torture record comes under scrutiny. Read more here. That's vague enough to potentially be very dangerous in a protest context. "Violence is not a constitutionally protected right," St. Louis Mayor Francis Slay said at a press conference on Wednesday, during which officials asked residents to "calm down" as anticipation grows over a grand jury announcement many believe is imminent. "Damaging property is not constitutionally protected, inciting violence that is an immediate threat is not protected by the constitution," Slay added, presumably as a warning to protesters. "We will not tolerate any of it." But it was not immediately clear whether officials were taking measures to address the Klan's threats. Ancona told MSNBC he has had "off the record" conversations with law enforcement. A spokesman for the St. Louis County police told VICE News that the department, which is one of several involved in monitoring the protests, had not met with Ancona, and noted that it is "taking measures to gather intelligence on any groups who may incite violence. The St. Louis Police Chief Sam Dotson said in an interview with Chris Hayes on Wednesday that police were "working on bridging gaps" in the community. "We're actually sitting down with organizers of protesters, trying to come to common ground," he said. Deep-running racial tensions have intensified in St. Louis since Brown's killing — and some protesters told VICE News someone left a noose in a camp they had set up on a Ferguson main road. As anticipation has grown over the grand jury announcement expected later this month, protesters have prepared by training activists in crowd control, developing support networks to respond in the event of arrests, and holding workshops on first-aid care and live streaming. Police departments across the area have meanwhile spent $100,000 on riot gear and have undergone "fair policing" trainings run by the Department of Justice. St. Louis residents have ominously described the preparations as "apocalyptic" and "ready for war." Governor Nixon noted on Tuesday that he has the National Guard on standby. "You're assuming that something's going to go wrong," St. Louis County Executive Charlie Dooley said at Wednesday's press conference. "I'm assuming that things will go right." Michael Brown's mom is taking her son's case to the UN in Geneva. Read more here. Speaking from Geneva, Switzerland, where she took her son's case before the United Nation's committee against torture, Michael Brown's mother Lesley McSpadden continued to call for the protests to be peaceful, and said she still hopes for an indictment. "We are praying for an indictment," she said on a media call on Wednesday. "That would mean they did their investigation thoroughly. I don't even want to think about the negative."